Like most online retailers, we’re always looking for ways to turn our website visitors into customers. We use Google Analytics to monitor the performance of our website and our online marketing and to understand how to make our website even more appealing to potential customers. As part of our ongoing efforts to improve our website, we recently asked ourselves: which pages on our site are most influential to our customers’ purchase decisions? For example, if someone visits our testimonials page, does that make them more likely to make a purchase? How about watching the videos on our leather page, visiting our gallery, or arriving on our small shoes or wedding shoes landing pages? We knew the answers to these questions would help us maximise the number of purchases from our website. To start answering these questions, we created a Custom Report in Google Analytics to review the “Highest Converting Pages” on our website. You can make a copy of our custom report setup here and use it with your own site data. We then divided Total Goal Completions by Pageviews (on a separate spreadsheet) to discover what percentage of people who visit a particular page end up making a purchase. We assumed that the higher the percentage, the more valuable that page for turning visitors into customers. We could then promote the content on those pages more across our website. We kept in mind a few circumstances that could impact this data. For example, people visiting our shopping cart or logging into our members area will have a high conversion rate, so we filter those pages out. Customers looking to purchase may be more likely to visit our page about our returns policy. We also kept in mind that we were looking at the same visit session only. Often, customers make multiple research visits before they finally make a purchase. Therefore, we were conscious that there may be other pages that motivate purchases, but are not reflected in our custom report because they were viewed in another session. We’re in the process of redesigning our shopping cart, and we’ll look at ways to incorporate this information within each step to reduce drop off and increase conversion rates. For example, we’ll provide information about our returns policy and deliveries within the shopping cart pages itself. This will reduce the need to click away to our FAQ page. We’ll also consider making some of this information, especially our customer testimonials, more readily accessible on our home page and custom shoe designer. We’ll include some of this information on key search engine marketing landing pages such as our gift certificate page. For example, we’ll incorporate customer testimonials in order to assure those purchasing our gift certificates that they are providing a gift that will be appreciated. This will be good information to incorporate into discussions on our Facebook fan page and in videos on our YouTube channel. We’re excited by the range of insights that Custom Reports provides us. It allows us to slice and dice our data within a single report rather than having to combine separate reports within a desktop spreadsheet. We would love to hear about the custom reports that you find useful for your online business. This post was first published on the Asia-Pacific Conversionroom blog. hi, Michael, a nice blog post! 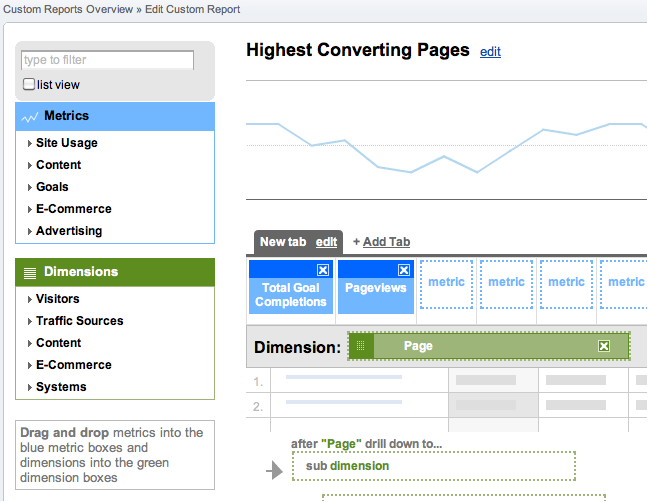 1) The same report by 'landing page', rather than 'page. 2) A 'revenue' column for finding pages that 'punch above their weight'. 3) Running this report limited to 'new visitors' to see which pages give you the best chance of acquiring a new customer. (rather than repeat visitors who will be far less sensitive to the design/proposition of the site). Thanks again - I look forward to reading more! Dan - great suggestions for additional ways to look at the data, I'll go have a play with those ideas. :) Thanks! That point about running reports like this just for the 'new visitors' segment is a brilliant extra tip. I'm going to try it right now with $Index before I even have a go with the custom report idea. I hit a problem with this approach. I need to report on particular goals not the overall totals (add to basket and the thank you page at the end of the checkout). And I also added in the total for ecommerce transactions. The results I got seemed strange to me and prompt me to wonder whether the goal counts and the ecommerce counts are being tied to the same session as the page view in the way expected. Have you been able to cross-check in any way to confirm whether the figures make sense on your site, please? That's a tricky one, lots of variables at play they so the best approach here will depend on your set up. 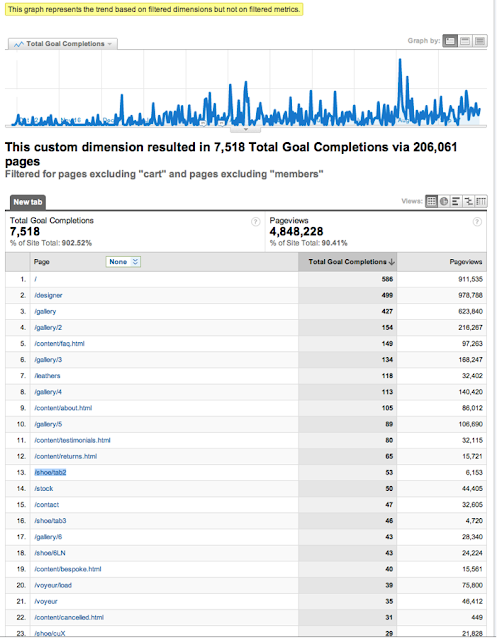 Might be worth posting this issue to one of the Google Analytics forums. Welcome to the Shoes of Prey team Penny!